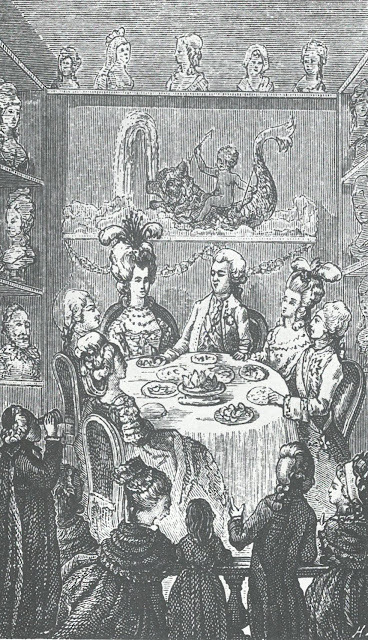 The waxworks cabinets of Curtius, particularly the Salon de cire in the Palais-Royal, specialised in effigies of Royalty "and almost all the famous people of our times". 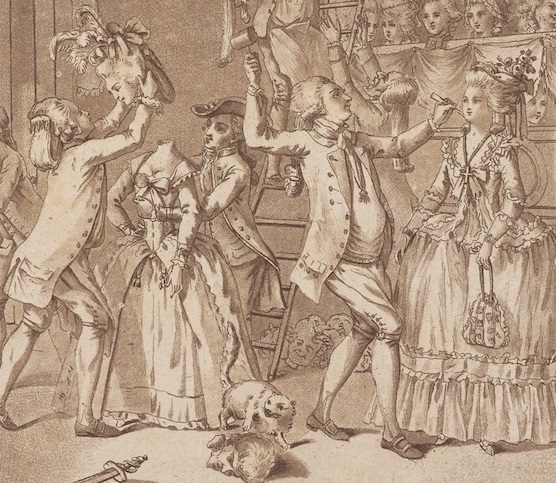 A conspicuous feature of Curtius’s exhibition in its heyday was its constant change - indeed, the rapid transformation of his models, sometimes with only a cursory redistribution of props, was the source of much ironic amusement. Nonetheless, a sense of the emerging concept of “celebrity” is evident in the mix of court figures, philosophers, actors and popular heroes like Blanchard the first man to cross the Channel in a balloon. 1. "Royal family and several foreign princes"
Though the diners changed, the Grand couvert remained on show in the boulevard du Temple into the 1830s. The Romance of Madame Tussaud identifies the London Royal family as a different tableau, depicting the seated figures of Louis XVI, Marie-Antoinette and their two children in full-dress court costume (p.33-4). According to the Tussaud catalogue this version dated from 1790; it is certainly later than 1789, since the "Dauphin" represented is Louis-Charles. As is often observed, Curtius's depiction of Royalty represented a significant erosion of the boundary between public and private. The Grand couvert, in real life a carefully orchestrated and controlled Royal appearance, was made visible, at least in effigy, to the ice-eating pleasure-seekers of the Palais-Royal. 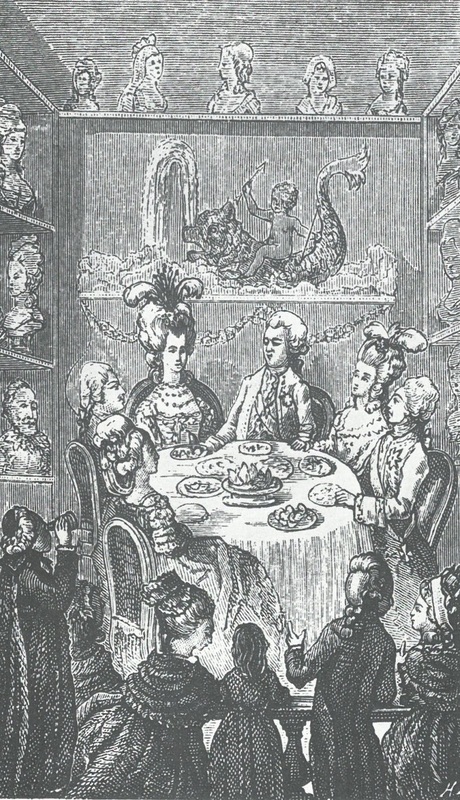 According to Kate Berridge, Curtius went further than this and also exhibited a tableau of Marie-Antoinette preparing for bed, turning the Queen, "into a fantasy boudoir femme fatale" (Berridge Waxing mythical, p.74-5) Certainly, the exhibition testified to the Queen's transformation into a fashion icon: the figure of Marie-Antoinette sported a replica gown made by the royal dressmaker Rose Bertin herself (In 1838 Madame Tussaud noted the insurance value of her genuine Bertin dress as £22: see Pilbeam, Madame Tussaud, p.124). The Tussaud memoirs perpetrated the myth of willing collusion, insisting that members of the royal family themselves "submitted to Madame Tussaud, whilst she took models from them".I n hindsight, the duc d'Orléans may be judged to have played a dangerous game by openly patronising Curtius. He gave him the official title of his painter and sculptor and in January 1785 took sons to see exhibition, where they were represented in effigy, though with "not very much resemblance" (Hubert La Marle Philippe Egalité (1989), p.64). See Meredith Martin,"Tipu Sultan’s ambassadors at Saint-Cloud: indomania and anglo- phobia in pre-Revolutionary Paris", West 86th, 21(1), 2014, p.37-68. During the American War a French expeditionary force had been sent to the aid of Haider ("Hyder") Ali, ruler of Mysore; he was widely rumoured to have met with the French admiral Suffren to discuss a coalition against the British. In 1788 Haider's son Tipu Sultan sent three ambassadors to France to pursue the prospect of an alliance and to further commerical ties. They stayed for three months and were widely seen in Paris, where they were a source of great fascination. Their visit spawned large quantities of merchandise, from prints and portrait busts to porcelain cups and fashion plates. Claude-André Deseine sculpted them and Elizabeth Vignée Lebrun painted their portraits. The duc and duchesse d'Orléans stole the limelight by receiving them publically in the Palais-Royal. 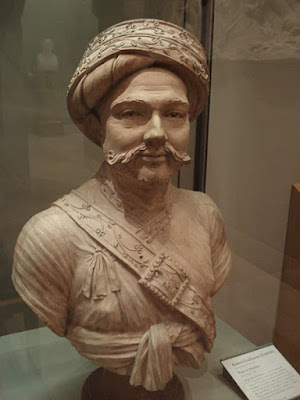 Deseine, The Ambassador Mohammed Osman Khan, terracotta; Louvre. 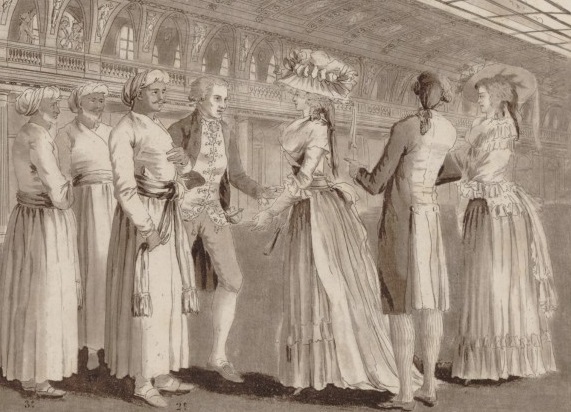 According to Madame Tussaud, courtiers at Versailles played a jolly trick on the Indian party by setting up a mock wax tableau at Versailles, which contained real people rather than wax effigies. Voltaire and Rousseau were among Curtius's most long-standing subjects. The American Elkanah Watson who visited the boulevards in 1779 described as the most striking of the wax figures, "the celebrated Voltaire, who is closely engaged with a table full of books papers etc. before him. His countenance expressed the very sensation of being a philosopher." (quoted by Pauline Chapman, p.23). In 1784 Mrs Cradock was less approving of a tableau featuring Franklin, Voltaire and Rousseau seated at a table: "the workmanship was so good that the very character of these famous, though baneful, men was conveyed by their appearance" (p.5-6; 59-60) Pilbeam, Madame Tussaud, p.25-6. 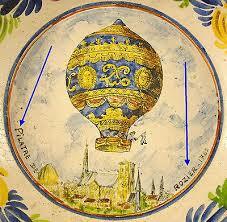 Jean-Pierre Blanchard, who made the first balloon crossing of the Channel on 7th January 1785. Jean-François Pilâtre de Rozier, who died in a ballooning accident at Bologne on 15th June 1785. 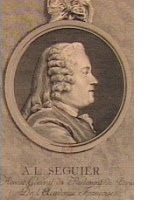 For a short time Pilâtre de Rozier had been another of Curtius's neighbours in the Palais-Royal, where he set up a scientific museum in December 1784. Louise Contat ,the actress who played Suzanne to much acclaim in Beaumarchais's Marriage of Figaro in 1784. Alessandro Cagliostro, the Italian Freemason and occultist, who was banished from France in 1784 when he was implicated in the Diamond Necklace affair. 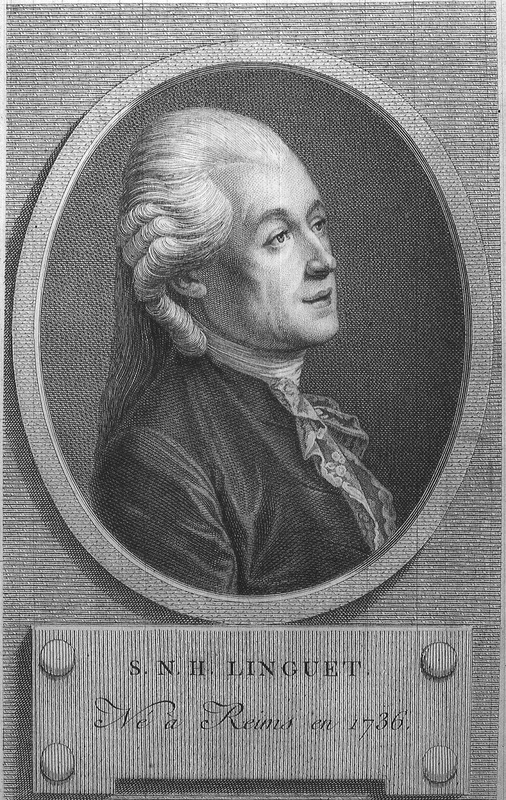 Guiseppi Pinetti, a showman who specialised in "experimental physics"; he appeared in Paris periodically between 1783 and 1787, and often performed at the Théâtre des Menus-Plaisirs. Tarrare - a showman who engaged in feats of eating. The Queen, perhaps too ready to fall into the error of following instead of leading the fashion, purchased a number of busts to distribute among the courtiers, who regarded them as an insignia of knighthood. Recipients of busts in plaster or biscuit ranked only as knights of the order; recipients of busts in alabaster or Sevres were treated as grands cordons or commanders. Fortunately Jeannot was not cast in bronze. Curtius's cabinet des grands voleurs may have lasted only briefly, but he continued to exhibit villains, both historical and contemporary - certainly they were a feature of the later exhibitions in the Boulevard du Temple.